WB ITI Result 2016 - WBSCVT; Entrance Test for Admission to ITI/ITC/Jr POLYTECHNIQ of West Bengal is over now over. The Admission Test was held on 05/06/2016 (Sunday) - only a single day allover West Bengal. Read this post to know details if Rank based Merit List of ITI/ITC/Jr Polytechnic Admission 2016 announcement date. 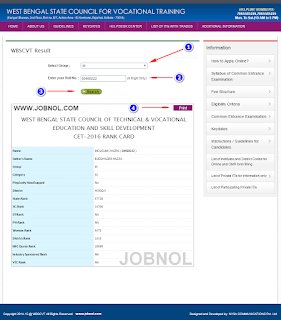 West Bengal State Council for Vocational Training (WBSCVT) introduced an Online & Offline OMR Application system for Admission to Indsutrial Training Institute (ITI) / Industrial Training Centers (ITC) / Junior Polytechnic across West Bengal. There are approx more than 72 Government ITI's in West Bengal and more than 73 Private ITIs in West Bengal. A merit list will be prepared based on performance of candidate in entrance test. There remains a counseling process by which candidates will choose their desired institute and trade combination. For detailed guideline on WB ITI Online counseling process you are requested to view another post created just for Counseling Process. Result for CET -2016 (Entrance Examination for Admission in Govt. ITIs/ITCs/Asansole Jr. Polytechnic of West Bengal) will be published on 1 7.06.2016 (Friday) at 11:30am . Result will be available on www.wbscvt.net. Candidates are requested to log in to www.wbscvt.net using their Roll Number / Application form number as printed in the Admit Card of CET 2016 to view their respective rank position. How to Check ITI Entrance Test Result/Merit List 2016 From Online ? Keep visiting This Page for Updates!!! 0 Comment to " WBSCVT West Bengal ITI Result of Entrance Test Rank Card of CEE 2016 - WB ITI Entrance Exam Score - wbscvt.net "